I will start this thread with a group of miniatures coming up for sale next month. 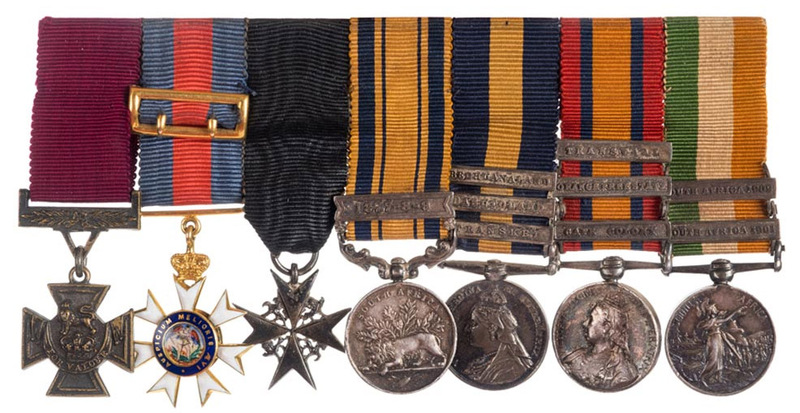 A unique and unusually interesting miniature 'Basuto Gun War' VC group attributed to Surgeon Major (later Colonel) Edmund Baron Hartley, VC, CMG Victoria Cross The Most Distinguished Order of St. Michael & St George (CMG), Companion's breast badge, gold and enamel with riband buckle Badge of the Order of St John of Jerusalem South Africa 1877-79, one clasp, 1877-8-9 Cape of Good Hope General Service, 1880-97, three clasps, Transkei, Basutoland, Bechuanaland Queen's South Africa 1899-1902, three clasps, Cape Colony, Orange Free State, Transvaal King's South Africa, 1901-02, two dated clasps, mounted for wearing, QSA suspension post slightly offset but generally extremely fine; together with corresponding riband bar for the full size medals. 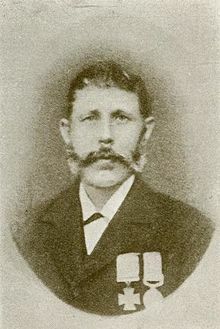 There were 13 recipients of the Cape of Good Hope General Service medal to qualify for all three bars, of which Hartley was the unique VC winner. This group of miniatures comes up for auction today so it will be interesting to see the hammer price. 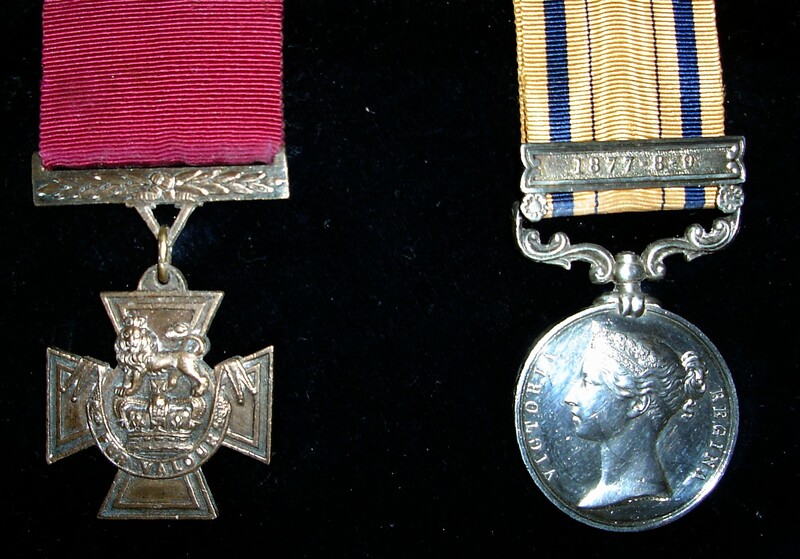 The miniatures sold for a bid of GBP 5000, or about GBP 6000 with comission etc. Note that there were 23 recipients of the CGHGS entitled to all 3 clasps, not 13 as stated in the write up. Thank you for checking that, Adrian. That's quite a price for a miniature group but then it is quite a group. From the Sotherby auction in 1906. Sold for £72 and £42 respectively. 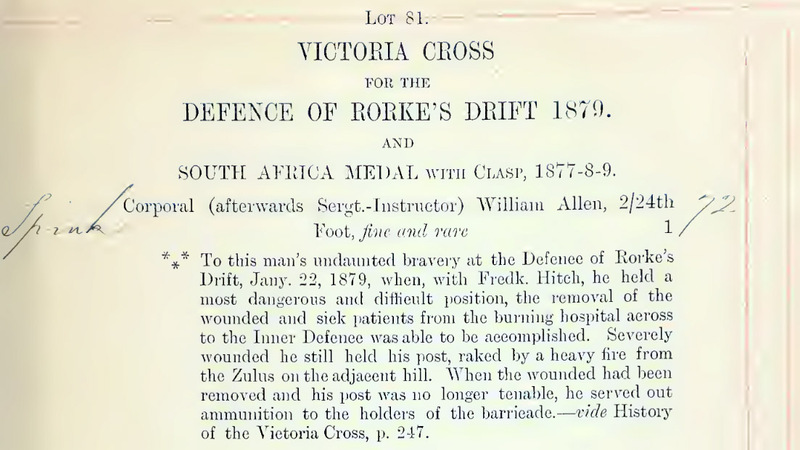 For those with a need to "finger" a VC , with permission of the curatrix of course, Peter Brown's VC is housed in the safe of the Amathole Museum in King William's Town. Worth a visit to King just to give it some fresh air. 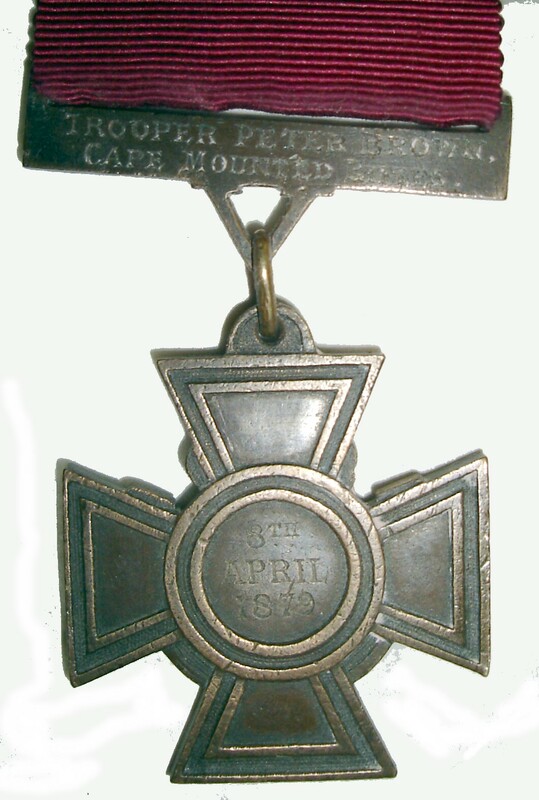 "The Queen has been graciously pleased to signify Her intention to confer the decoration of the Victoria Cross upon the undermentioned Soldier of Her Majesty's Army, whose claims has been submitted for Her Majesty's approval, for his meritorious conduct at Moirosi's Mountain on the 8th April, 1879, as recorded against his name:—Cape Mounted Rifles, Trooper Peter BrownTrooper Peter Brown, during the assault on Moirosi's Mountain on 8th April, 1879, whilst lying under cover waiting for the order to re-commence the advance, heard two men, who had been wounded some time before, crying out for water. Trooper Brown carried a water-bottle to these men, under a heavy fire, to an adjacent rock to which they had crept for shelter. 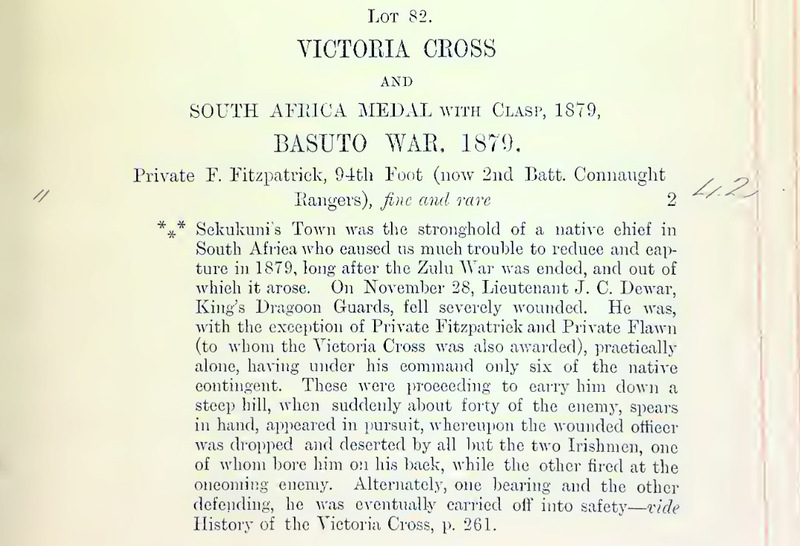 Whilst giving the first man water he was wounded severely in the right thigh, and immediately afterwards a bullet shattered his right arm, the use of which he has never recovered."